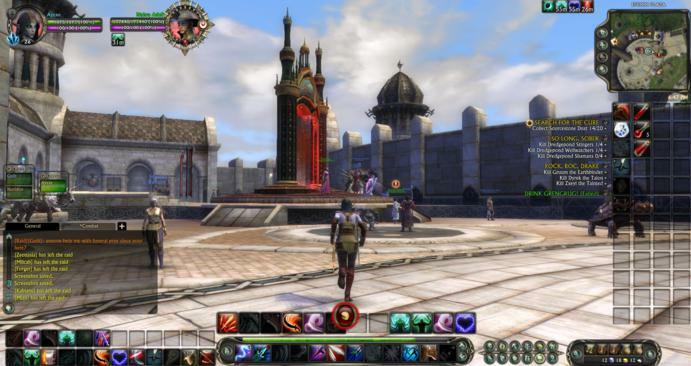 Rift is the latest MMORPG offering to hit the market. Developed by Trion Worlds and published by QV Software (here in Australia), it offers a beautiful world to explore and daring adventure to be had. Team up with players or solo the content, this game is easily one of the best MMORPGs out at the present. Regulos the destroyer led a campaign against humanity and lost. In his defeat he used a Defiant teleportation device to go back in time. Upon his leaving a dragon came along and so did the rifts. The rifts opened and eliminated humanity from the face of the world. But some gods intervened and resurrected a select few in order to embark on a quest to save the world from the rift invasion. Before creating a character you must first select your team. To play with friends you need to be on the same side. Basically the same thing happens as the Guardians, only instead of being resurrected by the gods, you are resurrected through technology. You are tasked with tracking down Regulos and putting an end to the rift invasion as well as gaining the upper hand on the guardians. To do this, they send you through a time-machine to a fixed location in the past. The story in rift is pretty much a backdrop for all the cool stuff to happen on. While it can be pushed to the side by most players, collecting all the books and learning the lore of the world really does enhance the gameplay experience. It adds an interest to the game, a reason for what you’re doing and best of all, some of the books are interesting and entertaining. The game doesn’t just use books to tell the story, it also engages the audience through pre-rendered cutscenes and NPC dialogue. I would say that if you don’t at least read some of the lore; you will be missing out on something big. You don’t have to read every piece, but the stuff you find along the way should be interesting enough just to take a closer look at. Stretching while I read my books. The gameplay of Rift is similar to most mainstream MMORPGs that have been appearing since World of Warcraft or even Everquest before that. The basic premise is that you do quests for certain non-player characters and they reward you with gold, experience and sometimes items. While quests are not the only thing that make up the game, they do make up of the bulk of what you’ll be doing while playing this game. There are also dungeons to explore, raids to be run and even Rifts to seal. 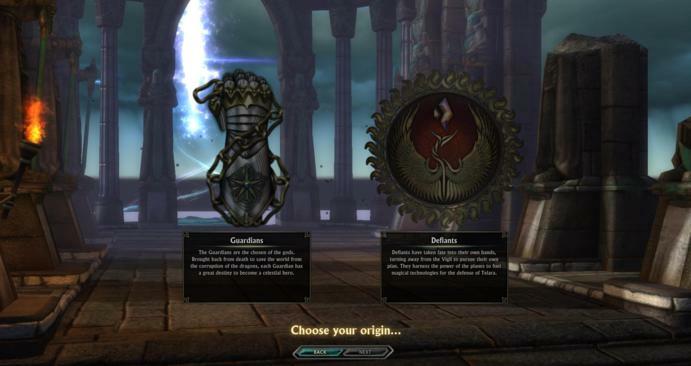 The game begins with players choosing a server to play on and then designing their own unique character in the game. 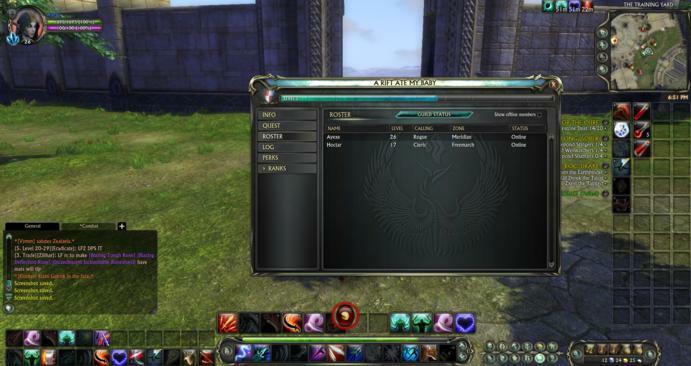 Each character can be heavily customised and players are allowed to store a large amount of characters across not only their chosen server, but also across all servers. The character customisation tool allows for players to fully customise their characters appearance. Faces, head shape, eyes, tattoos, height, class, race, gender and etc. are all customisable in the game. Each race in the game has it’s own racial abilities, though they are pretty much just a resistance to something and some other kind of non-ability enhancing ability. This makes all the races balanced which makes the game more interesting competitively. After creating a characters appearance and giving it a name, the game presents you with a short cinematic of your teams history and then plunges you straight into the newbie zone. Each of the two factions have their own newbie zones and they are both very similar in aesthetics, quests and layouts. The starter areas are designed to get you from level 1 to around level 5 in regards to character experience and also to gain and get used to your first three souls. Newbie Zones generally have players that like to dress this way. In this instance it was me. In Rift, souls are what determine a classes abilities and talents. Each class has 9 souls and can have any three active at one time, so long as the soul is unlocked, and can have up to four combinations to quickly switch between, as opposed to visiting a soul trainer to re-specialise. Additional souls can be unlocked by doing special quests in a factions capital city, which generally involve closing a rift and then using the rift fragment to summon a spirit of the soul that you are trying to unlock. Soul Tree. As you can tell, I like to focus on one branch primarily. I quite like the soul tree feature, but in some aspects it’s a bit clunky. As you level you gain points to distribute through each of the soul trees that you have active, but it becomes easier to simply specialise in the one that suits your play style then to evenly distribute points between each of the trees. The developers try to combat this by having some kind of lock in each tree which stops you from adding more to that tree until you reach a higher level. This kind of forces you to spend your points in the other trees, even though it’s not something that I agree with. If I want to specialise completely in one tree I should be able to. The good thing about the soul trees is that they’re both customisable and fixed. What I mean by this is that you are able to distribute points on one section of the tree and when you reach a certain amount of points spent on that particular tree, a kind of sub-tree advances and unlocks more skills for you to utilise in combat. In combat, players utilise the skills that they have gained from their souls to defeat their foes. Simply right-clicking on an opponent will cause your character to auto-attack the selected enemy, assuming that you are in range. 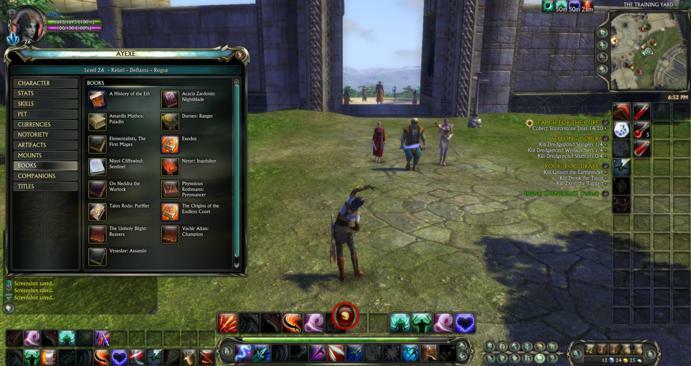 Players can assign skills to their hotbar in order to quickly access spells and skills that they have acquired over the course of the game which adds a way to quickly utilise these skills in combat. By default players are given a hotbar or two, but more can be added in the interface settings in the options menu. I found that adding more bars to the game made things much easier to manage. You can also change the positions of these bars in the interface settings. 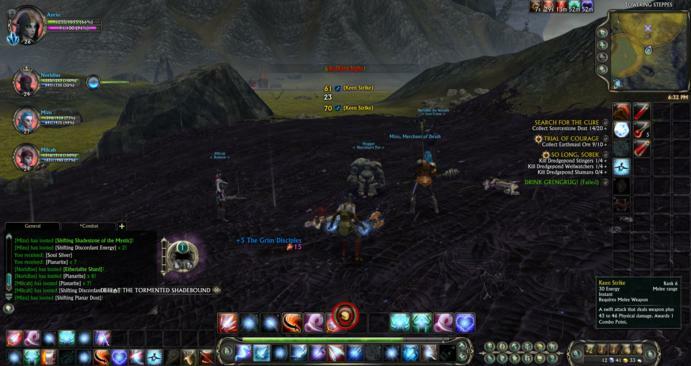 By using skills on the hotbar on enemies while in combat a player character will perform that action in a way that is relevant to what’s happening. For instance, a potion will affect the player (regardless of whether they have targeted an enemy or not) whereas an attack action will not work on a friendly target should they be targeted. If a player has smart-targeting turned on in the options, any skill used without an enemy selected will automatically select the nearest enemy and use it on them. It’s quite handy. Public Group after we just closed a Rift. It was pretty fun. Rift focuses heavily on teamwork with the game almost pushing it into your face with all of its “Join Public Group” and “Merge Public Group” options, as well as all the team based content; like dungeons and battlegrounds. This is good as the game is a MMORPG, which means that multiplayer is a core feature of the game. What’s the use of having all the other players around if you’re just going to solo it all anyway? Not that you can’t solo it or anything, but it is a lot more fun playing with others. One of the most fun things you can do with other players is take on a series of rifts. As you approach a rift you will receive an option to join a public group with any other players in the area, assuming that they are solo or have an open party. When you attempt to close a rift you have to take on 5 waves of enemies, which include a sub-boss and a main boss. What’s really interesting with the rifts is that if you do well you have a chance of gaining some really nice loot, which makes things like dungeons a lot easier. Even if you don’t do all that well on the scoreboards for closing a rift (which can be quite often) you still receive Planarite and other things that can be traded in for more goods, like armour. All of the gameplay elements in Rift meld together very nicely. Everything works, everything is smooth, easy to understand, nice to look at, responsive and intuitive. This means that you spend less time fighting with the interface and more time actually playing and enjoying the game. The world is expansive, the battles range from easy to difficult and there is a lot of lore and hidden items to collect. The inventory, skills and every other kind of window that is used for tracking stats, quests and etc. are mapped on both the GUI and the keyboard and both feel quite natural to use. I have to mention that initially I got confused with some of the key bindings on the keyboard, although they’re all fully re-mappable, I didn’t feel the need to change any of the bindings. PvP is both fast, strategic and requires a large amount of teamwork to become successful at. Dungeons are a blast to play through and you’ll likely find yourself wanting to complete another run immediately after the completion of a successful dungeon. Something I haven’t seen in a MMORPG for a while now. To finish off the gameplay section, I will briefly go over the chat functions. Basically you press enter to chat. This will make you talk to the people immediately around you. But, like most MMORPGs, you can add switches to the beginning of what you’re saying to talk to a different group. For example, ‘/p’ will switch your chatter to all party members. There are many different switches, like: /p, /g, /y, /r and there might be a few others, like /1. 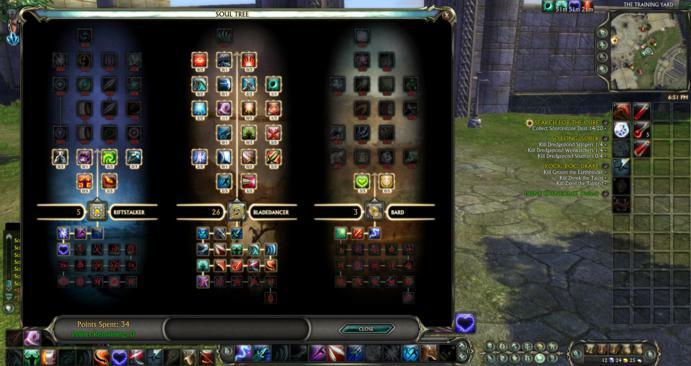 There is also a special overlay for guilds, which is accessed from the guild tab on the GUI or the assigned hotkey. This shows all members of your guild and everyone that is online will likely receive any messages sent to them via the /g switch. Guild Interface. Unfortunately only two members were on at the time of photography. One of them being me. The sound effects in Rift are quite good. The music does its job but is really forgettable. The music itself is mostly orchestrated works with an emphasis on the horns. This makes it feel like it’s inspired by Inception, I just can’t game to slow-paced music for too long. Personally I think Rift ate about 3-4 hours before I turned the music off and I switched into Windows Media Player mode. This isn’t a record for a game, it’s just a personal preference really. I should also mention that while writing this review, I did actually go around with in-game music on to give it a fair judgement. Each skill has a sound effect assigned to it, but I can’t quite work out if some of the effects are borrowed or shared between skills, or if they all have their own fully unique sounds. They’re an aspect of the game that I believe works almost perfectly. So props to the sound team for that. Through the game, some of the NPC’s talk, some of them do not. Usually the speech is limited to a catch phrase or two while handing in a quest and other times comes in the form of grunts by the player character. The voice work is a nice addition to the game and adds a level of character to the otherwise empty-shells that are the NPCs. For an MMORPG and as a game itself, Rift has an amazing graphical fidelity. It looks great, it runs smoothly even if you have a low amount of frames (I mean ~20fps) and doesn’t look too bad at lower settings. The character models are mostly accurate to human proportions, some might be a little idealised while others aren’t actually human, so that’s definitely something good. The armour and weaponry all fit the characters really well and do not look out of place in the game. Though one complaint I have about the armour in particular is that they seem to re-use the same base model and skin a lot. Sure the stats are new, but didn’t I just shift that piece off 3-4 levels ago? While this isn’t necessarily a bad thing, it does make it hard to distinguish a decently geared player at a glance from a lesser geared player. The proportions are mostly human. One of the features I love about this game graphically is it’s use of colour. Man, seriously, the colours that come off those rifts are so awesome. Especially the Purple that comes off the Death Rifts, so very, very pretty. The colours aren’t just used by rifts though, they’re used on everything, some things are more naturally coloured than others, and all pieces of armour are fully colourable via the dyeing mechanism. Everything in this game looks incredibly nice. The water, the trees, the ground and even the buildings. Everything is crafted very nicely and you can tell that the developers went through great lengths in order to get the game to be as high a quality, graphics wise, as the game could realistically be given current technological limitations. I mean, I have a fairly nice gaming rig (i7, 8gb RAM, 5770HD) and even it is pushed in some places. Very pretty city in a very pretty game. 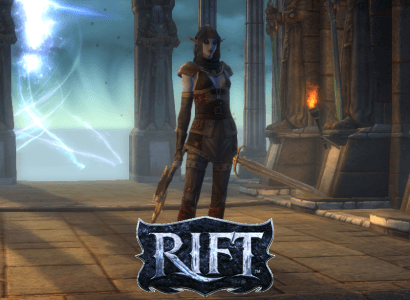 Rift is a solid video game, not just as an MMORPG, but as a game in general. Initially, I was not too impressed with the game as I felt it was just a simple rehash of the same-old style being employed by MMORPGs for a while now. But after playing through it and getting a feel for the world, the mechanics and all the little things that start to add up; I became highly impressed with the game. As someone once told me in-game (paraphrased as I can’t quite remember the exact quote): the developers have taken the best bits out of all the successful MMOs and combined them together to make a really good game. That someone is my all-wise guild leader Maelcontent. I, for one, look forward to continuing my adventures throughout Telara.